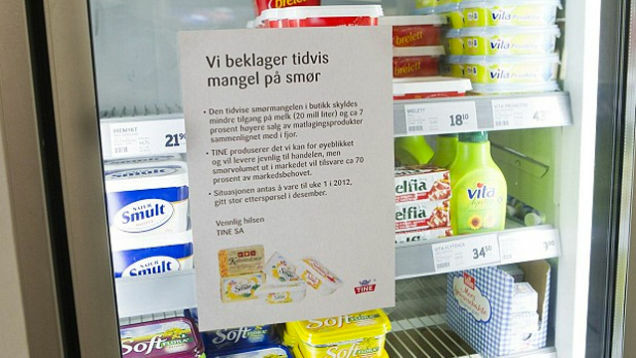 The grim situation in Scandinavia worsened over the weekend as the Norwegian government, attempting to cling to power in the face of a severe butter shortage, arrested two Swedes who'd been attempting to smuggle 550 pounds of butter over the border. Americans have so far largely ignored the crisis developing in the Nordic countries: a faddish low-carb, high-fat diet, a bad year for dairy production, and the vicious and violent nature of life in the frozen north have combined to create a severe lack of butter—even as Scandinavians are gearing up for their most-celebrated holiday, "Christmas." The two men, who snuck into the country from Sweden, were arrested with about 550 lbs of butter divided into 18-ounce packets, the Norwegian daily newspaper Adresseavisen reported. "They have confessed that they have bought butter in Sweden to sell at a profit in Norway," legal counsel Amund Sand told the Adresseavisen. Meanwhile, unconfirmed reports of butter-hoarding warlords in the north of Norway have emerged as authorities remain unwilling to even estimate the number of deaths the crisis has caused.